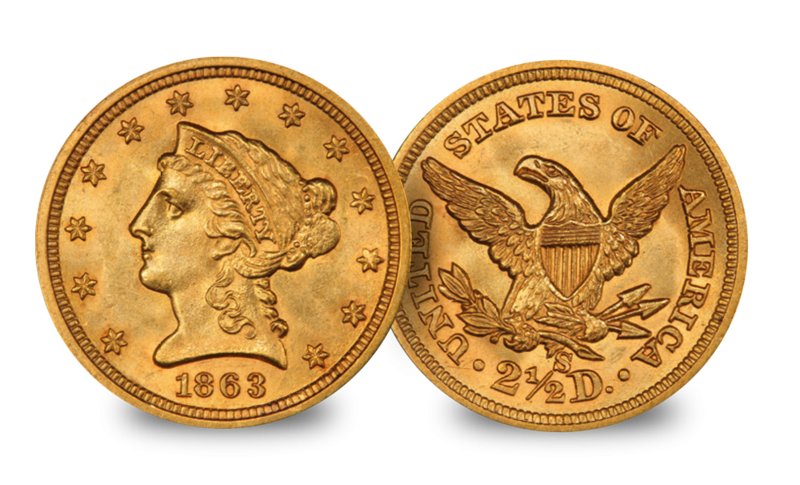 A stunning set of two gold coins from the time of the American Civil War. 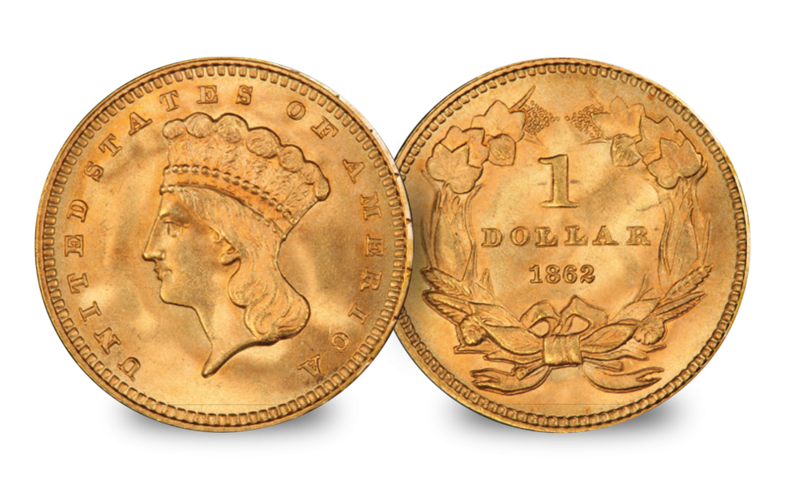 The one dollar "Indian Princess" and quarter eagle "Liberty Head" gold coins - a testament to one of the most important eras in American history. The American Civil War ripped the nation apart, lasting more than four years it came at a staggering cost – the loss of almost as many American lives as all other wars combined. Like all wars, it also demanded a great deal of money to pay for troops and equipment. While the Confederate economy relied almost exclusively on paper money, the North controlled the two major mints (Philadelphia and San Francisco) and the huge resources of the Californian gold mines, ensuring that it could mint a reasonably steady supply of gold coins – including the two smallest gold denominations, the $1 and $2.5. James B. Longacre’s gold one dollar ‘Indian Princess’ design shows Liberty wearing a feathered headdress.On the reverse is an agricultural wreath showing the products of both the Northern and Southern States (cotton, corn, tobacco and wheat). It was a potent symbol of the union so terribly rent apart during the Civil War (1861–5). The gold quarter eagle of $2.5.shows Liberty wearing a small crown, encircled by thirteen stars representing the original colonies that declared their independence in 1776. The reverse features an American eagle, wings outstretched, clutching three arrows (symbolising strength) and an olive branch (symbolising peace), with the US shield composed of thirteen vertical stripes on its breast. 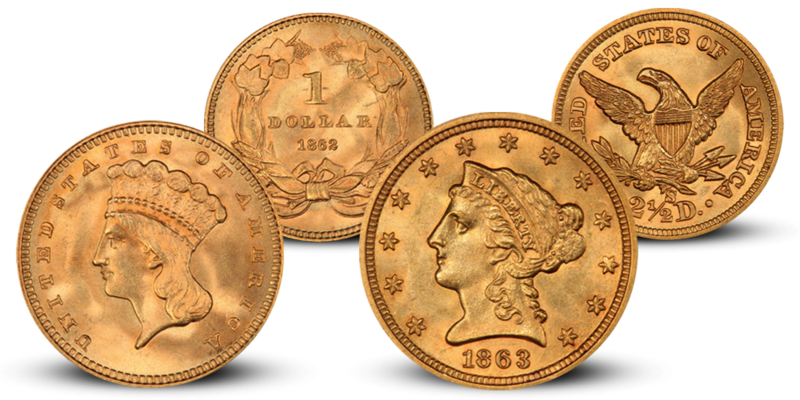 Extensive gold amassing led the U.S. government to drastically reduce the mintages of these coins during the Civil War making issues from this era particularly rare. 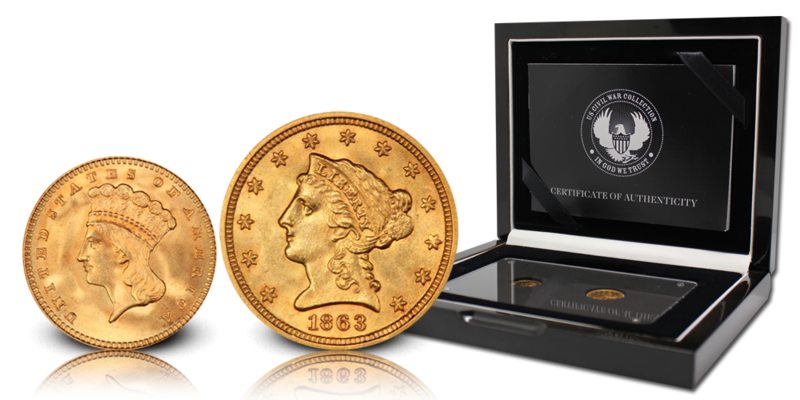 Now, you can honour the memory of this pivotal and defining event in the American history with these two historic gold coins that survived the devastating War Between the States.